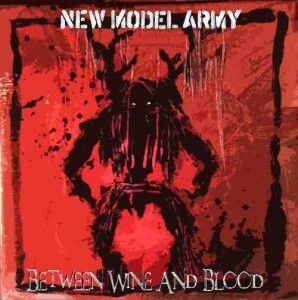 It’s an exciting time for New Model Army fans and followers at the moment. I’m one and I’m excited. The band are about to embark on yet another tour, taking in Germany, Sweden and landing back in the UK for 2 special Christmas Shows in London and Nottingham. 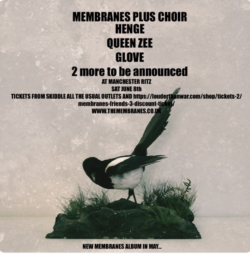 This tour is largely the one that was postponed earlier this year following drummer Michael Dean’s knee operation problems – he returned to live action in time for Sonisphere in Knebworth this summer. On October 5th, the long awaited documentary “Between Dog and Wolf” premieres at the London Raindance Film Festival – it’s a film which charts the band’s history, from inception to BDAW, and is produced by Royal Television Society Award winner Matt Reid. And now we have their latest recorded offering, “Between Wine and Blood”, which comprises of a 6-track mini album and an 11-track live album from last year’s BDAW Tour. I eagerly opened my copy of BWAB and marvelled at its beauty. A glossy red CD booklet, with Joolz Denby’s latest creation on the cover and throughout. One or two tracks had been trickled out pre-release, so I already knew that yet again, something special was in store. Mixed by Joe Barresi (known for his work with QOTSA, Soundgarden, Tool and Hole), it’s in many ways a continuation of a theme from the last album, Between Dog and Wolf. In other ways though – for me anyway – it also contains strands of the past, a proud past on which so many of us have been brought up! According To You is simply stunning. I’m filing it with those classics Believe It and Fate from The Love of Hopeless Causes, with a return too of the haunting chanting last heard in High. It’s got great melodies and it’s catchy – damn catchy. On to Angry Planet…for me, there’s a hint of Ten Commandments in that early drumming. I can just picture the pit now when this is played live – angry guitars, angry lyrics, sweaty shirtless bodies bouncing off each other, bright lights, arms to the skies…this is New Model Army at their electrifying best! Guessing is destined to be another pit favourite. It really is hard for me to find words to describe how good this tune is…all I know is that by this stage of the album, I’m feeling good. Feeling great. Feeling proud of following and loving a band who, despite their years, continue to produce tracks like this one. Happy To Be Here opens with the sound of a storm, similar to the all classic Green and Grey. Then a soothing bassline before Justin Sullivan delivers mellow but emotional words – “I go this way alone, but I’m happy to be here”. Again, it’s very catchy – I know I’ll be singing that line over and over and over again. Devil’s Bargain is, for me, the clearest continuation of BDAW. That drumming does it, giving it that tribal feel which featured so heavily on the last album. Sunrise is the final track on the mini album and is also the new single. The melodies over Justin’s acoustic guitar make this perfect, peaceful late night listening. The 2nd CD of 11 live tracks from the BDAW Tour demonstrates how strong an album that actually was (Top 30 in Germany and UK) and how well the tracks worked in the live arena. The Manchester gig on that tour was one of my all time top NMA gigs (over 200 to choose from!) and this CD provides us with a perfect quality testament to that tour. It’s another thumbs up for Between Wine and Blood – those gigs are going to be fantastic. Exciting times indeed!